My goal this week was for Time Is Irreverent to become an Amazon #1 Best Seller in at least one category. Yesterday I accomplished that when my novel hit #1 in Parodies. Then, even though I sat at #2 in multiple categories, all the books ahead of mine had such strong sales that they looked uncatchable—at least in the short term. Much to my surprise, when I checked Amazon ten minutes ago, I found my book at #1 in a second category. 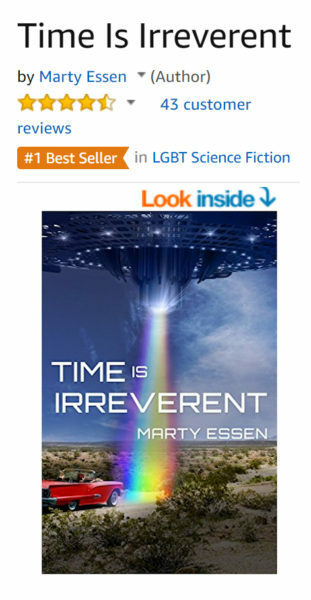 Time Is Irreverent is now #1 in LGBT Science Fiction! My novel is still at #2 in Humorous Science Fiction, #2 in Political Humor, and #2 in Dark Comedy, so it’s onto my next goal!